MoneyMorning.com Dr. Kent Moors writes: The overall trajectory for oil prices remains upward, despite taking a breather today. I still see prices reaching $65-68 for West Texas Intermediate (WTI, the benchmark traded on the NYMEX) and $73-78 for Dated Brent (the other major benchmark set daily in London). 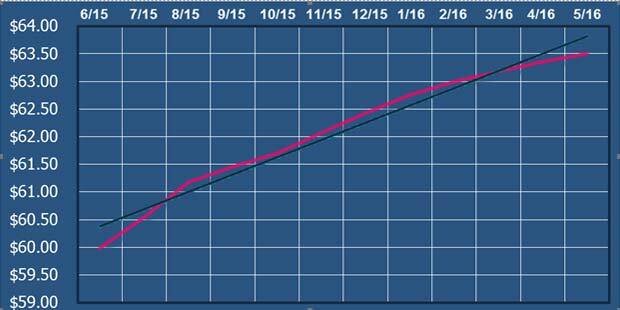 But this is hardly going to be a straight, linear rise. Rather, it’s going to occur in what I call a “ratcheting” pattern: occasionally jerking downward along the way. One of the primary concerns causing some of the sudden drops in oil prices is the impact of excess production. The traditional belief has been that downward prices discourage forward commitments of capital expenditures, thereby reducing supply and more closely associating prices with demand. Operating companies have been slashing the financing of new wells, and the number of rigs in the field are now down to levels not seen since the credit crunch. So we should have seen a corresponding drop in production. 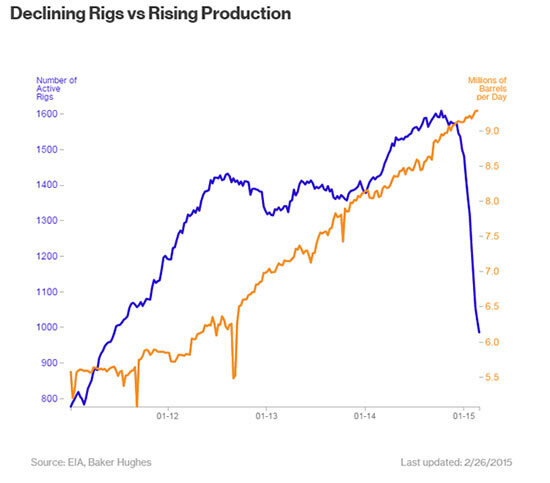 The rig count dove, but production continued to move up. The explanation for this phenomenon lies in the ending production from the newest wells drilled. The rise in oil volume has come from those wells brought on line over the past year and a half. Advancing technology and the number of wells per pad have brought in far more oil than expected. Now, as we have previously noted, this production will begin to taper off mid-summer. Primary extraction levels from these shale/tight oil wells occur in the first 18 months on average, with a marked decline then taking place. However, another factor is in play here. There was a counterintuitive move to maintain production during the period of low oil prices because companies were seeing the rise in prices comping and wanted to stockpile crude in advance of the price improvement. That trend is now drawing to a close. And that makes the current quoted price (and the move up) more representative of what is actually happening. Supply is once again moving more in tandem with demand. There are three pictures to view in this regard. The first involves the New York Mercantile Exchange (NYMEX) crude strip and contango. Futures contracts on oil are entered throughout the day for delivery from one month to several years out. At any given time, the NYMEX crude strip provides us with a very nice snapshot of what the futures curve looks like. Below are the one-year strip prices at close last Friday. The red line is the pricing for each one-month contract increment, while the black line is the trend. Notice this is a classic contango – that is, each month’s price is higher than the month(s) preceding. 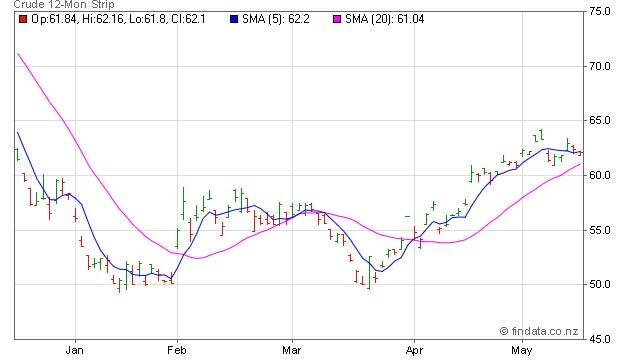 Looking as this, companies assume the price is rising moving forward. Remember, each of these monthly prices represents the average of contracts. The actual market price, therefore, is expected to be higher. Taken by itself, this might seem to add motivation for stockpiling more production, thereby accentuating the surplus and actually depressing the short-term price. But stockpiling makes sense only if there is a significant discrepancy between current and future prices. The strip prices, on the other hand, are moving in the other direction. They are constricting. That is today’s second point. The five- and 20-day moving averages of the 12-month strip rather dramatically illustrate an initial opportunity to improve return, followed by a converging of the indicators. Bottom line: The current pricing environment is providing a declining return from stockpiling in anticipation of a major correction. 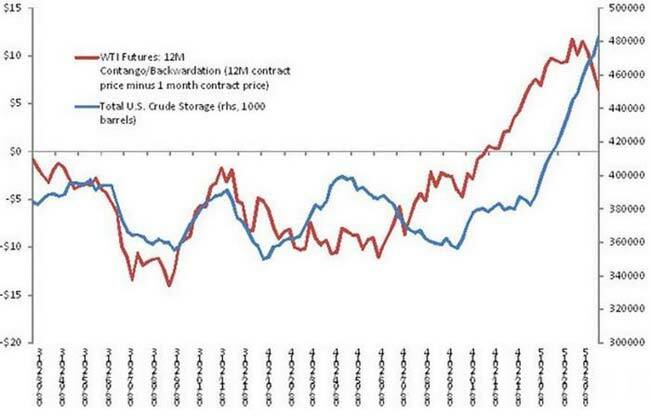 Third, as expected from this, we see in this final chart that crude storage rates are now closely tracking the 12-month WTI price. All of this leads to one basic conclusion. The talking heads on TV may still predict rising production. But absent a major correction in the market, there are declining profit-margin reasons to stockpile crude. There is still plenty of supply out there. We are unlikely to see massive new excess surplus coming on line to depress prices.